The following are select venues that we have visited and or attended an event at – in the Los Angeles area. 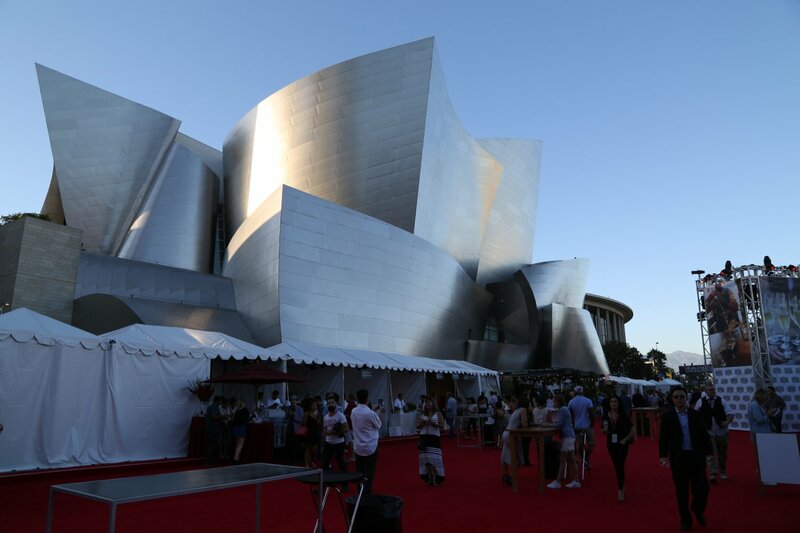 Some of these venues are also discussed on our Hollywood page. Also note that sports stadiums and arenas often hold live performances and host major entertainment stars. 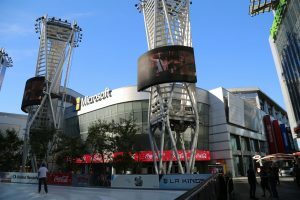 We provide reviews of the major LA area stadiums and arenas here. 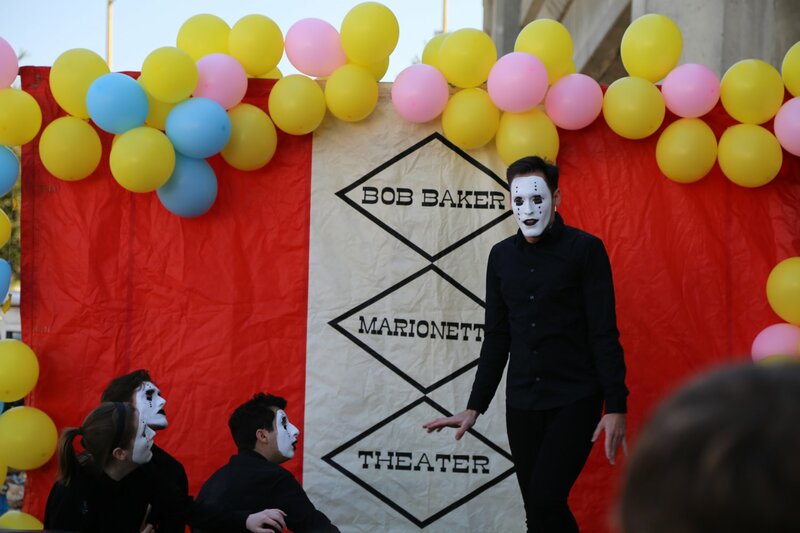 Bob Baker Marionette Theatre. 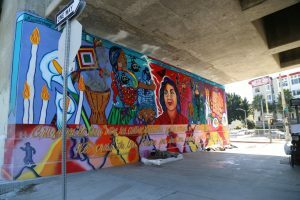 If one spends some time digging through all the layers of Los Angeles, one finds the city is full of pleasant surprises. In a world full of digital animation (much of which is actually done in California) it is refreshing to discover something as old school as a puppet show. Tucked away just outside of downtown proper, the Bob Baker Marionette theatre is located just off of the 110 freeway and in the shadow of the raised Beverly Street/1st Street Bridge. 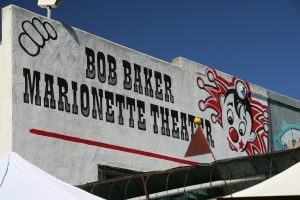 The theatre was founded by Bob Baker and Alton Wood in 1963 (housed in a building that dates from 1953). 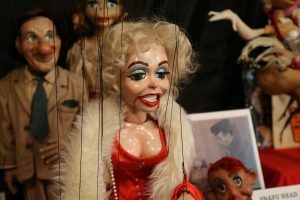 Bob Baker is considered an icon in the world of puppets and his works have been featured in a number of TV shows and films. 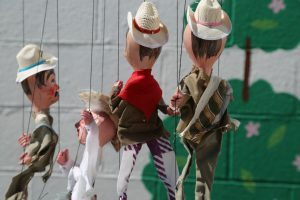 The became interested in puppets as a child; while at Hollywood High School he began making and selling toy marionettes. 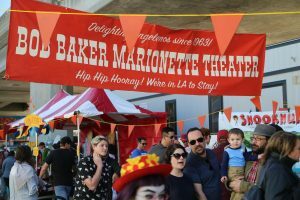 This is the oldest children’s theatre company in Los Angeles and supposedly the oldest continuously operating puppet-theatre in the country. 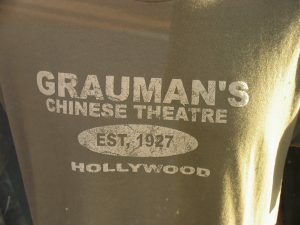 Such is the importance of this theatre, they were made Los Angeles Historic-Cultural Landmark #958 in 2009. They are also a 1(c)3 nonprofit organization. 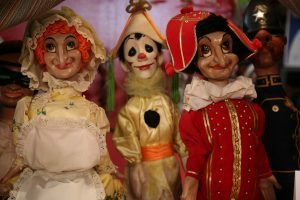 The theatre hosts more then 200 performances a year of which more then 2000 hand-made puppets are used. In addition to the scheduled performances, Bob Baker often takes their puppet shows on the road – for birthday parties or other private events. 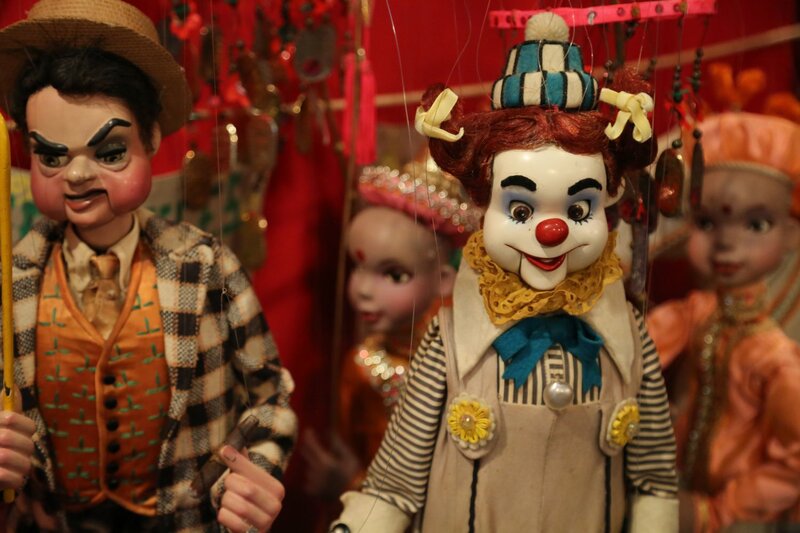 The museum is fascinating containing a colorful collection of curiosities – hundreds of puppets dangle from strings – some apparently are quite old. 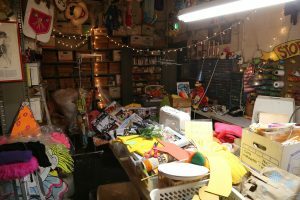 Also check out the puppet workshop – a small space strewn with the tools of the trade – everything you need to build and repair puppets including string, cloth, hair, moldable heads, quite a collection of glues and other miscellaneous items. There is even a puppet built in the vague likeness of Marilyn Monroe. 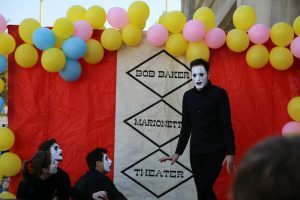 If you are in town for their annual Bob Baker Day – you will not want to miss the free to the public festivities that take place on the street directly outside of the theatre. 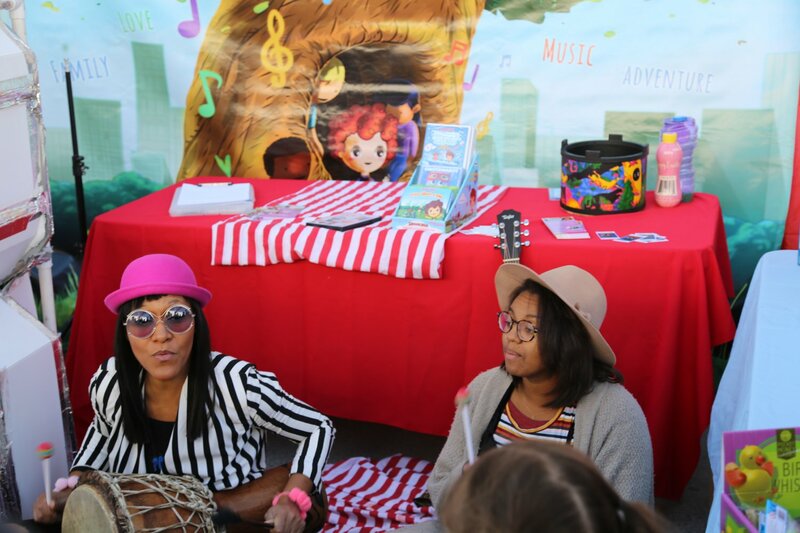 A celebration of creativity with something for the entire family. 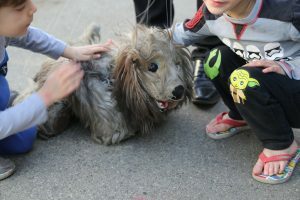 Kids bring their own puppets, some homemade – puppet shows continuously play outside, staff introduce the public to unique and exciting puppets (two we saw during a visit included a real life looking dog and a carrot puppet – imagine that!). 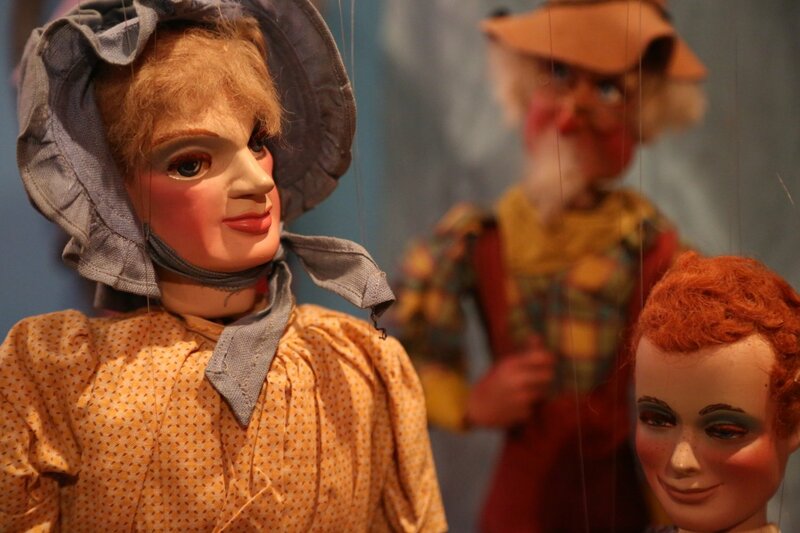 Shows in the main theatre continue throughout the day and the small adjoining puppet museum is open to the public. 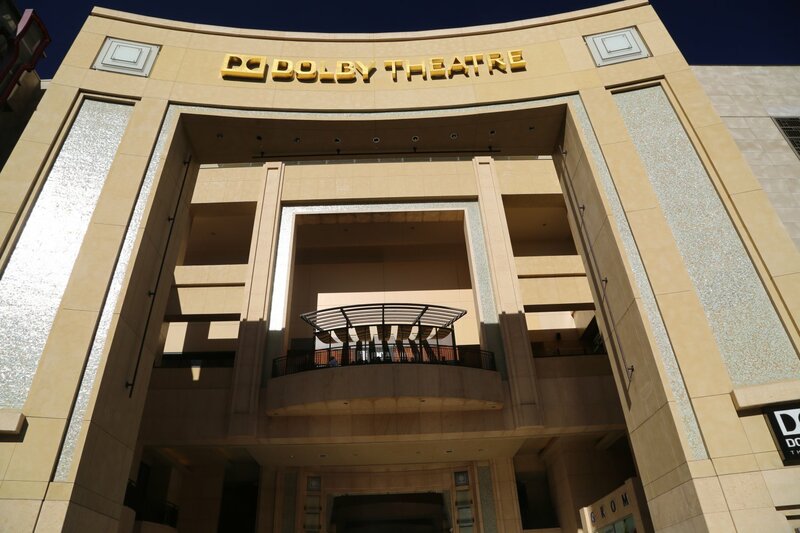 Dolby Theatre (formerly Kodak Theatre) is located almost next door to TCL Chinese Theatre is home to the Academy Awards as well as many other star studded events. 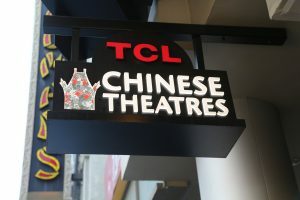 This is a relatively new theatre having opened in 2001. 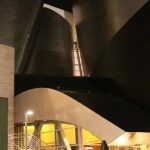 Over 94 million dollars was put into the construction of this – its unbelievable inside – this is one of the highlights of Hollywood and we highly recommend taking a tour. 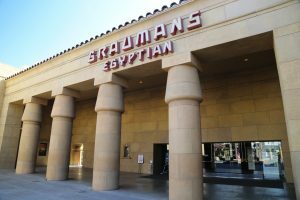 Be sure to stop at the Hollywood Visitor’s center (ground floor on Hollywood Blvd) to pick up a coupon for several dollars off admission to the Dolby Theatre. 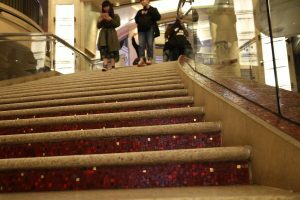 During the Oscar Awards a huge red carpet is rolled up and down Hollywood Blvd outside of the theatre and it goes to the main entrance. 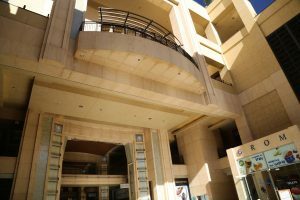 Public admission to the Academy Awards is by a lottery only and there is a very careful background check – and you have to go through heavy security the night of the actual awards. 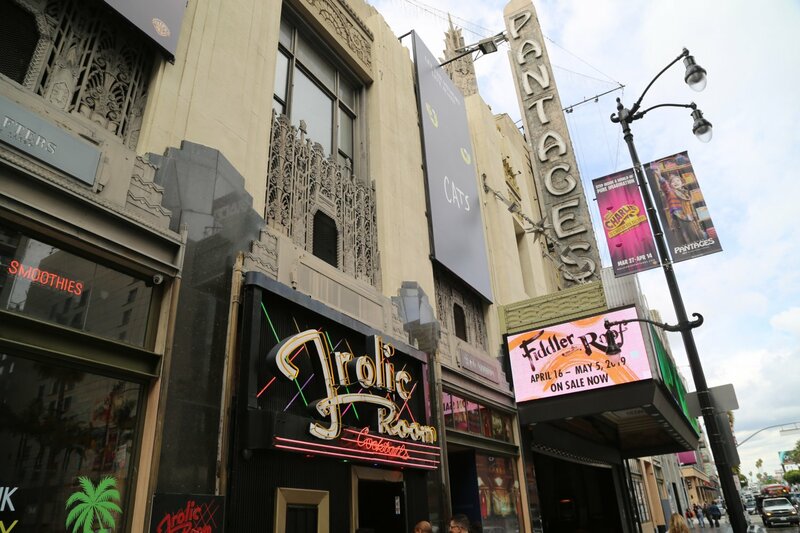 We’ve been on Hollywood Blvd during the Academy Awards and there is always an air of special excitement on this one day per year. 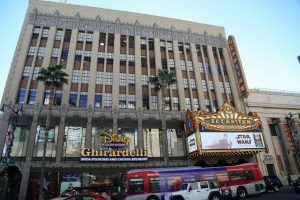 Hollywood Blvd around the theatre is completely closed down as are side streets and the metro does by passes this normal stop. 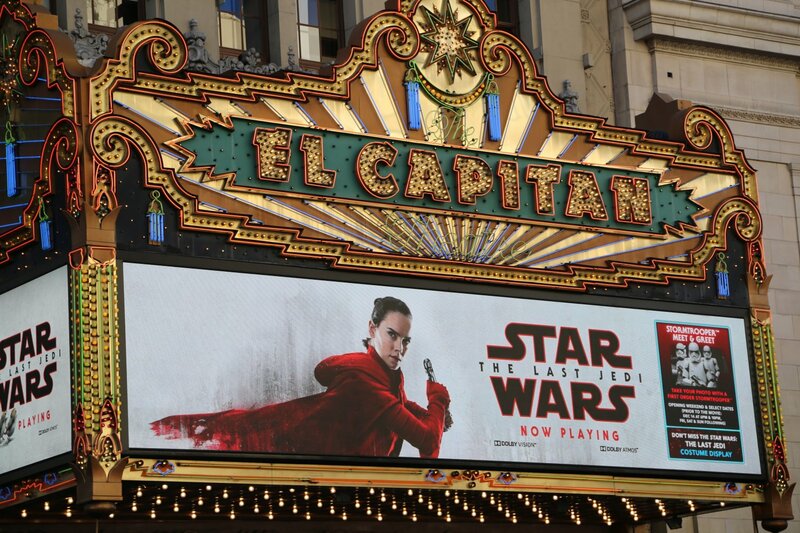 Helicopters, planes and even a Goodyear Blimp hover above the theatre. 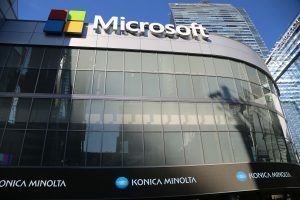 Preparation and rehearsals for the Academy Awards takes at least 3.5 weeks before the actual “big night”. Your tour will take you inside the VIP room which is contained on one the side of the main lobby. 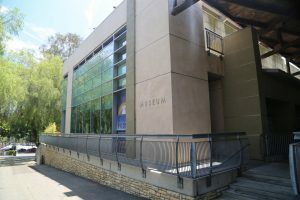 The architect used “soft glass” so that when you walk on the outside of this room the windows instantaneously turns fuzzy and you cannot make out the features of those inside. However at certain angles you can see who is inside; this was done so those outside of the VIP room have at least a glimpse of who is inside there, but at the same time gives the celebs their privacy. Be sure to check out a real Oscar award on display in the VIP room. 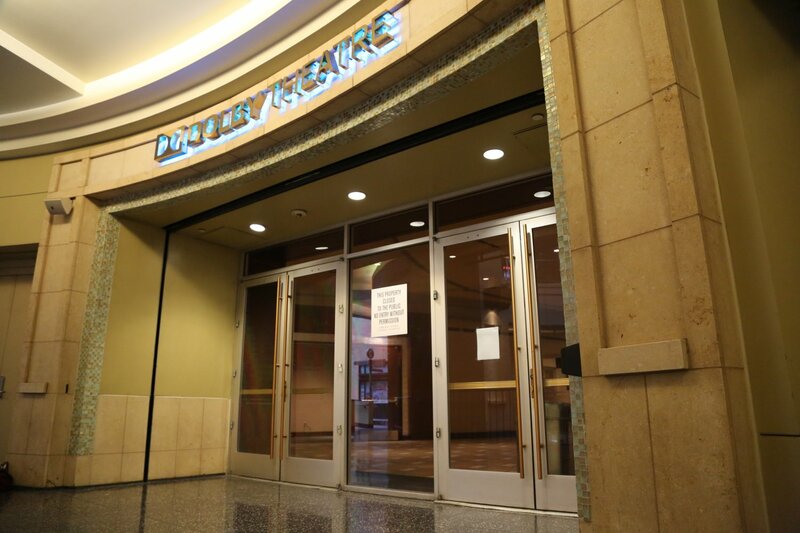 During the Academy Awards there is no VIP room and this room is not closed off from the main lobby. 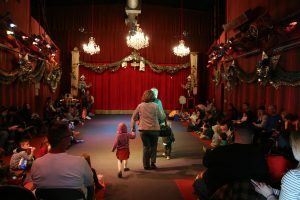 Unlike other theatres this theatre was specifically designed to be a studio as well as a theatre all rolled into one building. 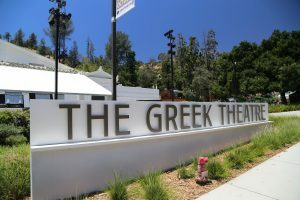 This is very unique as in LA you have specific studios or you have specific live theatres, not both. 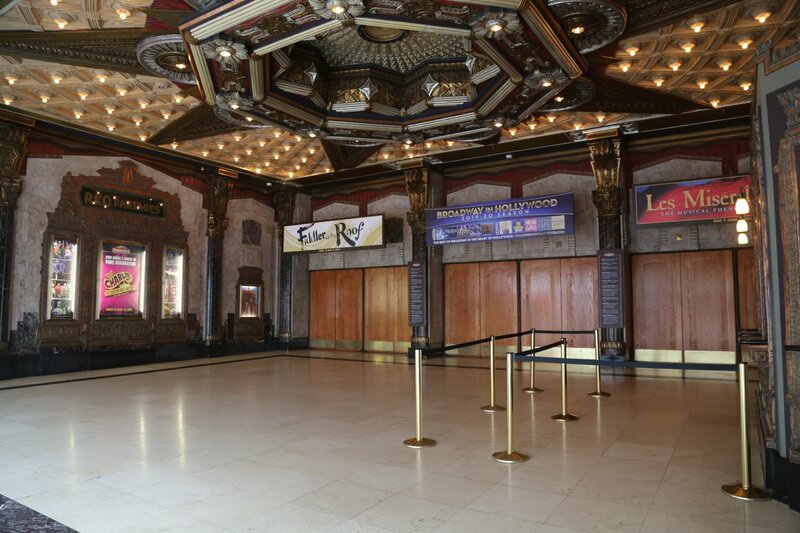 The stage is enormous (one of the largest in the world) and you will have a chance to walk across it during your tour. 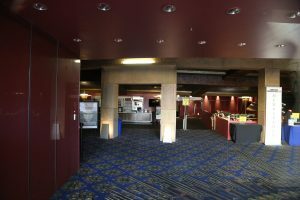 The main room is high-class – with balconied sections and plush carpet and seats. 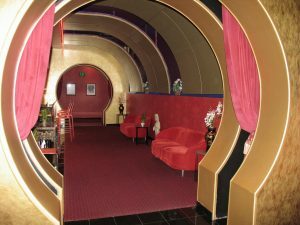 You will have a chance to sit in the front row during your tour and there may be large photos in the seats indicating where celebs sat down during the latest Oscar Awards. The tours last 30 minutes. No recording equipment including any type of camera is allowed (must be turned off as well as cell phones). 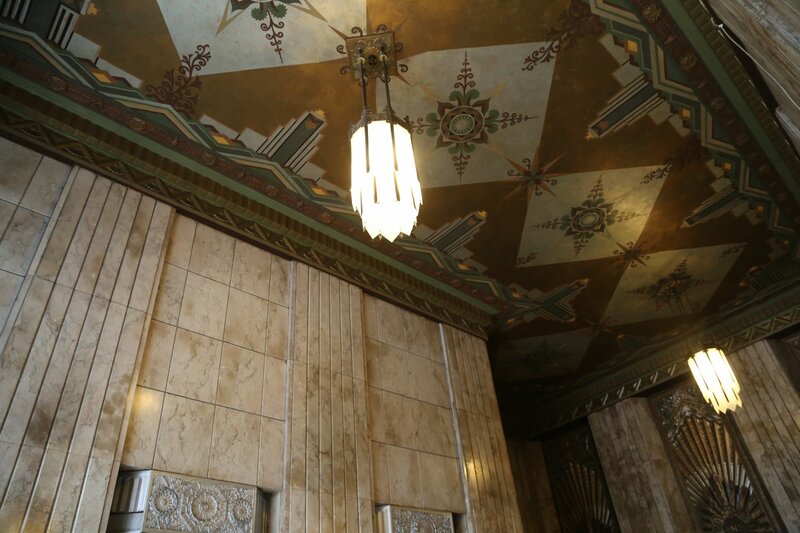 We snuck in one photo of the main lobby which appears here but for other photos you have to visit their website. Perhaps next time we will take a hidden camera – its not like this theatre is ever photographed. 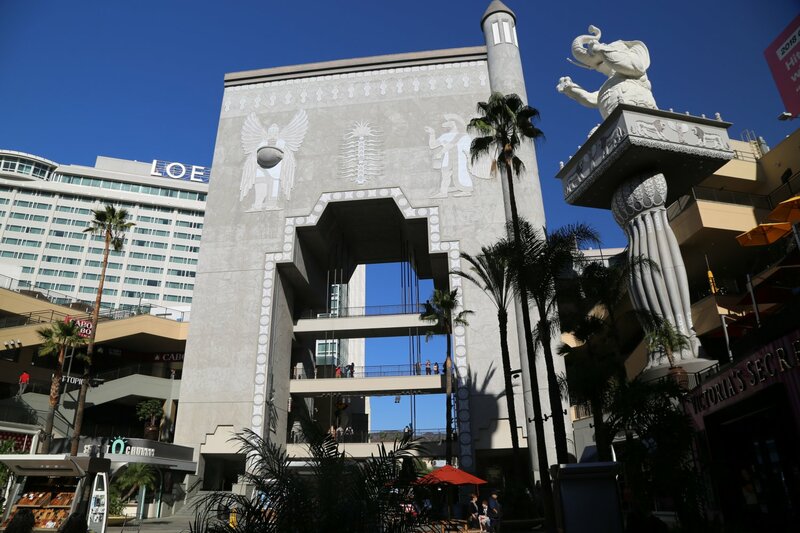 The easiest parking is at the garage at Hollywood and Highland. 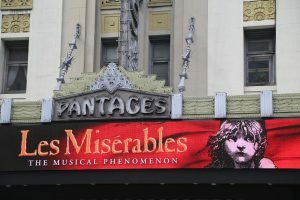 Advance reservations are highly recommended especially for weekends and summertime. Visit: www.dolbytheatre.com for more information about tours and this theatre. 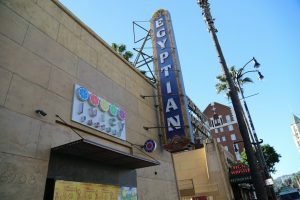 Egyptian Theatre is located in the heart of Hollywood at 6712 Hollywood Blvd. This is one of Hollywood’s most historical buildings; it dates from 1922 which coincidentally happens to be the year King Tut’s tomb in Egypt was discovered. 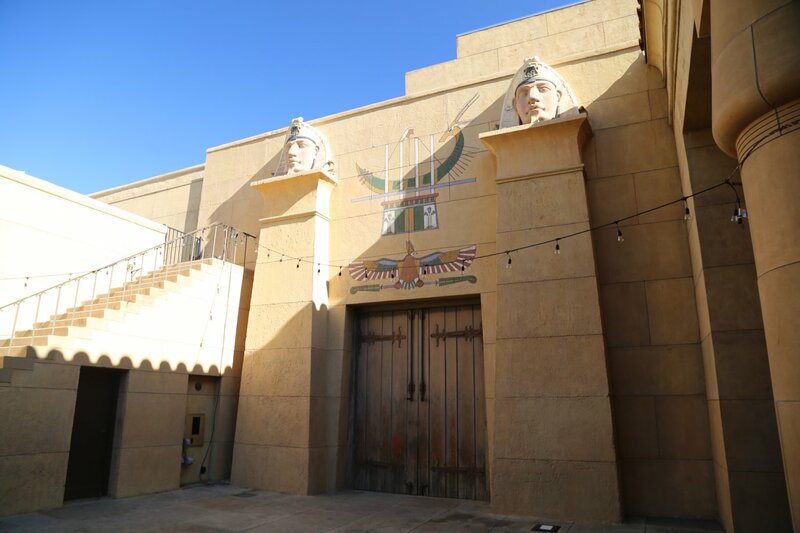 As a result this building is very Egyptian looking from hieroglyphics on the outside walls to statues and large columns. This theatre is set well back off of Hollywood Blvd so it sometimes can be easy to miss – the open courtyard is an excellent place to take photos. 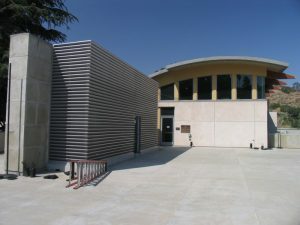 It is right next door to the historic Pig’n Whistle Restaurant and nearby the Ripley and Guinness museums. 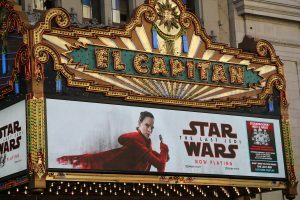 El Capitan Theatre is located at 6838 Hollywood Blvd right in the heart of all the Hollywood action across the street from the Dolby Theatre and the TCL Chinese Theatre. 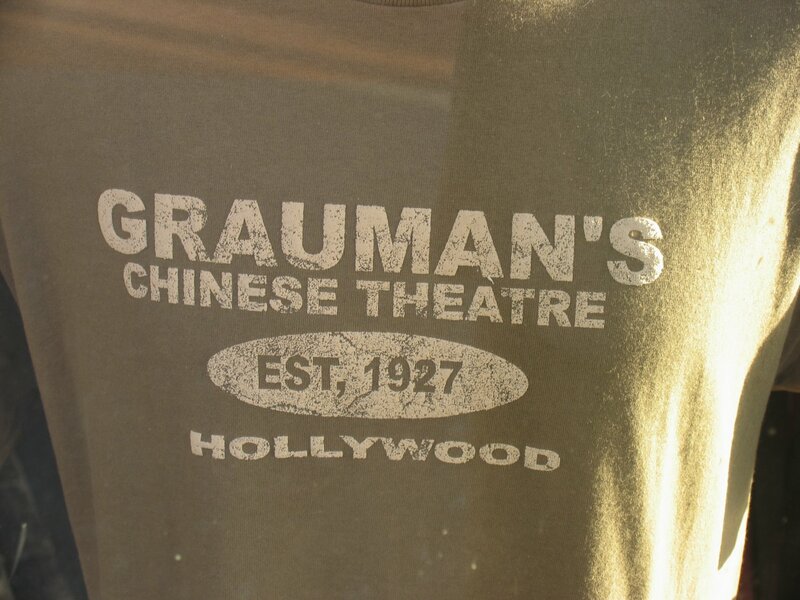 A lot of old Hollywood history is contained within its’ walls. 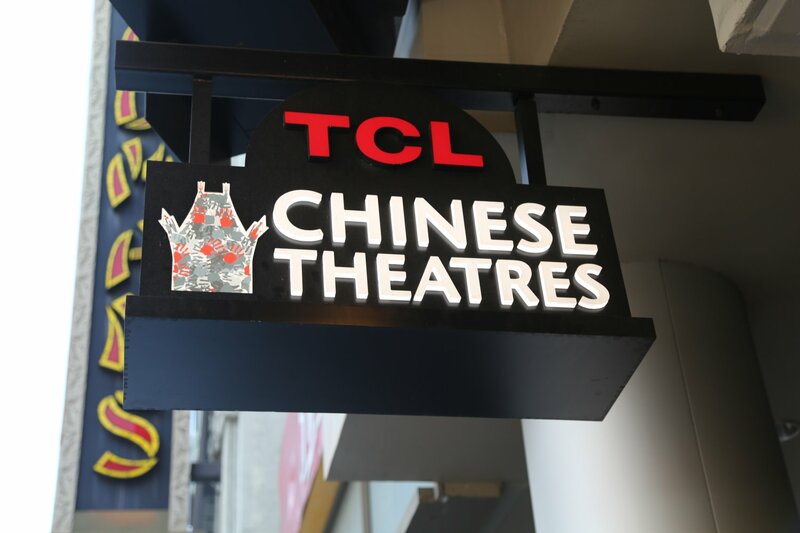 Founded in 1926 by prominent Hollywood real estate magnate Charles Toberman (also involved in numerous other now iconic Hollywood projects including the Egyptian Theatre, and the TCL Chinese Theatre). 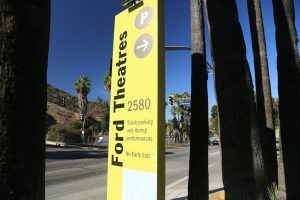 Ford Amphitheatre is located at 2580 Cahuenga Blvd East just off the 101 (East side) not far from the Hollywood Reservoir. 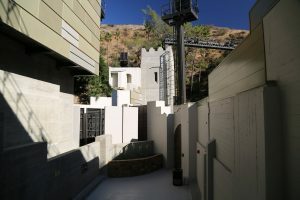 It is a small outdoor theatre owned and operated by the County of Los Angeles. 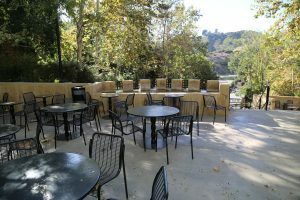 The setting is beautiful; it it surrounded by the hills of the Cahuenga Pass and due to its intimate location, aside from standing in their parking lot you hardly even know you are next to one of LA’s most major freeways, the 101! 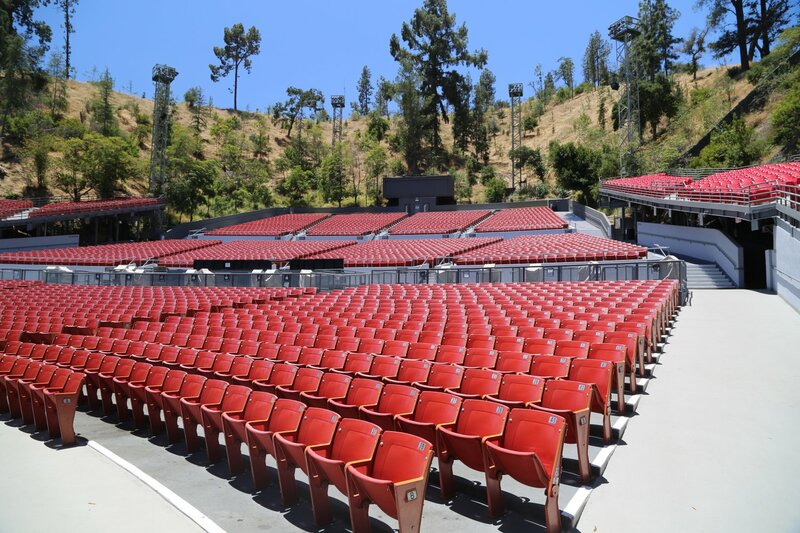 The total seating is under 1300 which when compared to the nearby 17,000 seat Hollywood Bowl, is quite small. 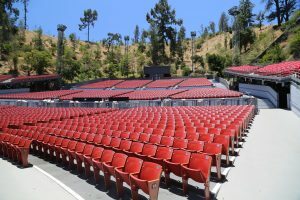 In addition all seats are less than 100 feet from the stage which if you’ve been to the Hollywood Bowl you know about the “nosebleed” seats, hundreds of feet from the stage! You can actually see the Ford Amphitheatre from some of the higher seating at the Hollywood Bowl. 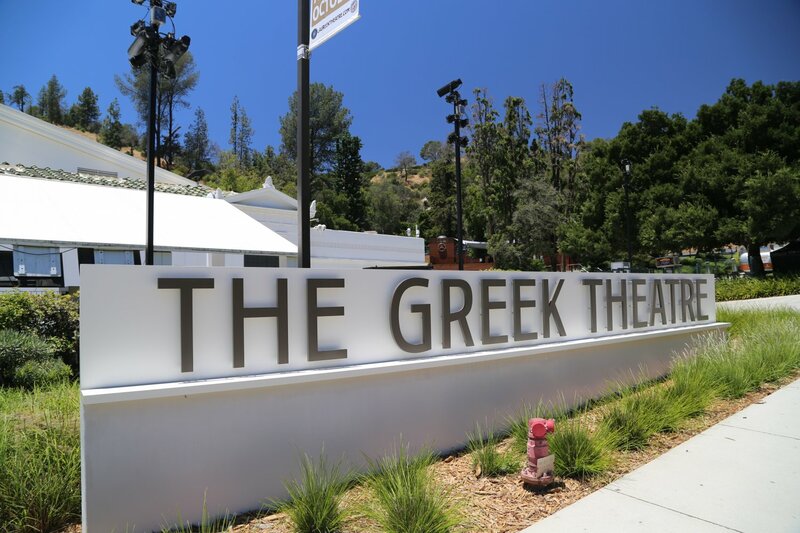 Greek Theatre is located along North Vermont Ave off of Los Feliz Blvd. 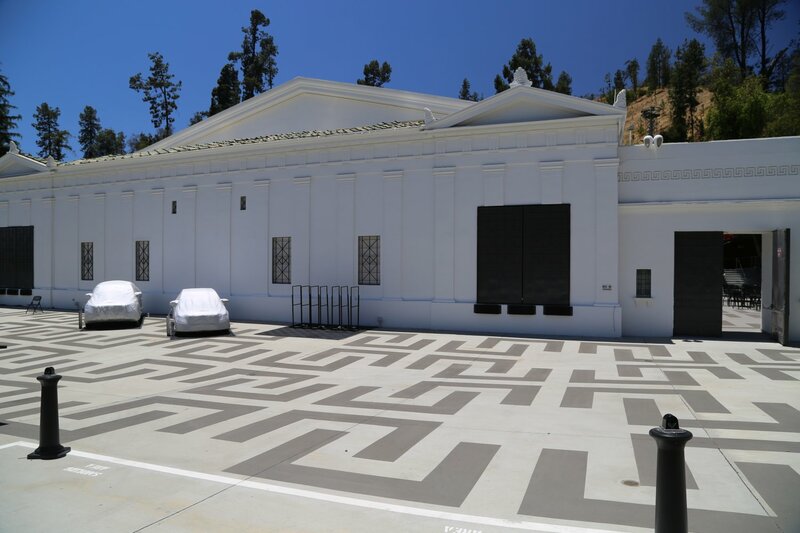 This, along with Griffith Observatory was built in 1929 from money left by the founder of Griffith Park, Griffith J. Griffith. 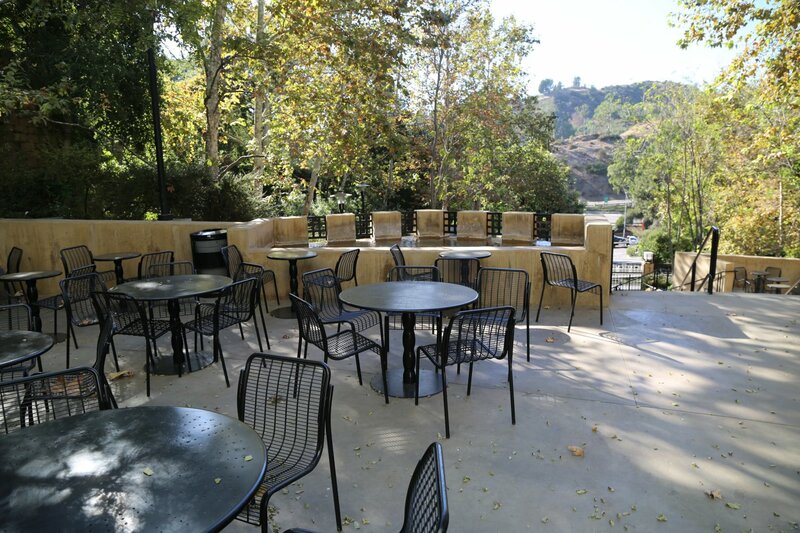 The location is in a canyon and was chosen as the outdoor acoustics are very good. Griffith was a character who during a vacation to Santa Monica shot and severely wounded his wife, and as a result spent time in San Quentin. 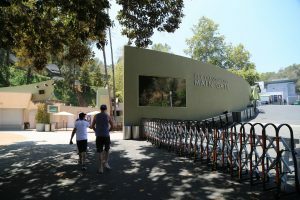 He also had a generous side as he donated 4000 acres to the City of Los Angeles for Griffith Park. 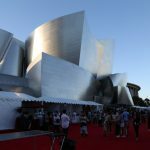 Hollywood Bowl is the quintessential big time outdoor concert LA experience. Since 1922 the bowl has played host to some of the worlds greatest rock stars. 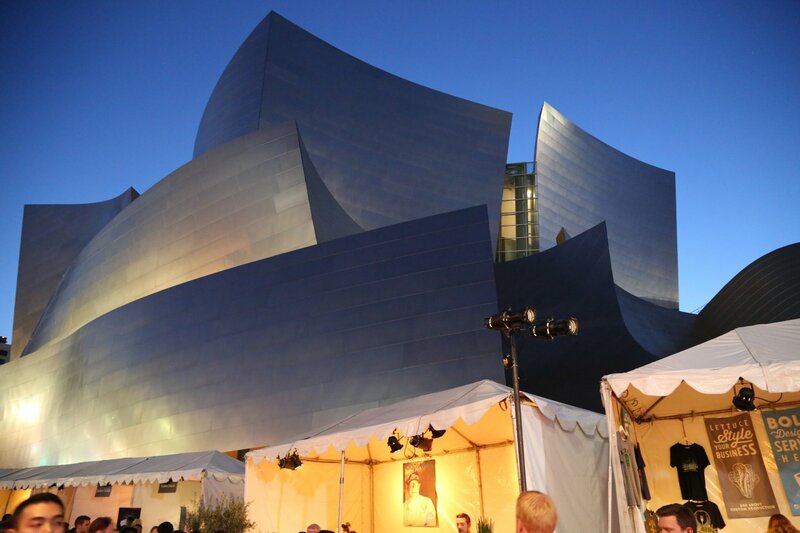 Outdoor theatres don’t get much better than this one. Big name entertainment regularly plays here. 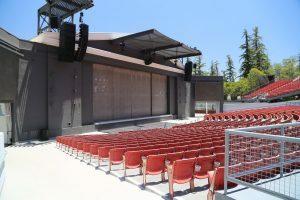 This amphitheater seats more than 18,000 people – as a result bring binoculars if you are seated in the distant seats as the musicians will look like ants from this vantage point. This is the largest natural amphitheater in the United States. Pre-concert picnics have always been popular here and parts of the grounds open up 4 hours before the concert actually starts. The Hollywood Bowl is nestled in the hills that make up the Cahuenga Pass just up from the 101 freeway and the Hollywood sign is clearly visible from the amphitheater as is the nearby Ford Amphitheater. On warm summer evenings it does not get much better than this. 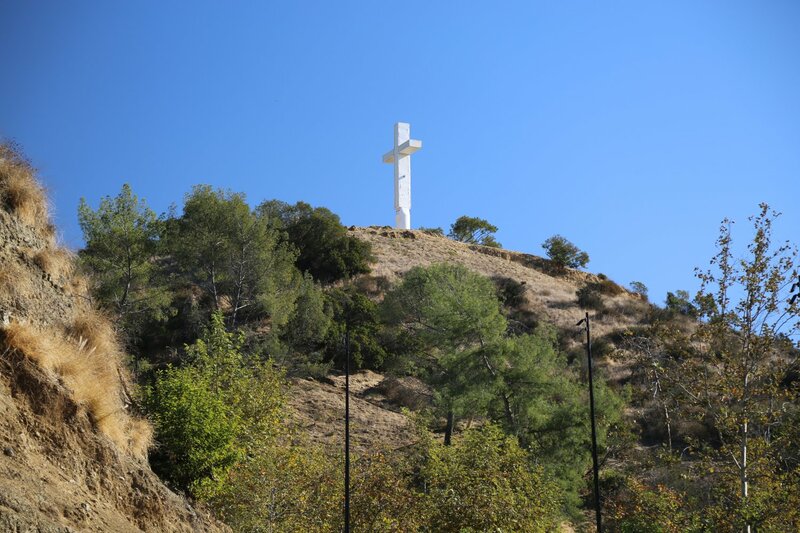 When night falls you can also see the lighted cross on Cahuenga Pass which seemed to especially dominate the background during the song “Losing my Religion” at an REM concert we attended here. Be sure to check out the small two-story museum (free admission) which chronicle the bowl’s history including location, architecture and its rich representation of famous artists who have performed here over the decades. Many photos are on displays of past shows, backstage moments and other memorabilia. 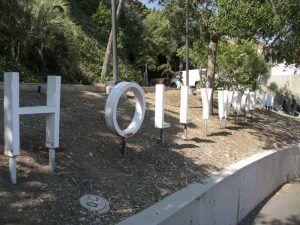 The Hollywood Bowl is also the summer home to the LA Philharmonic and the Hollywood Bowl Orchestra. 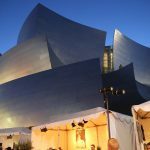 Outdoor summer classical music – a warm wind, picnic in hand – not bad! 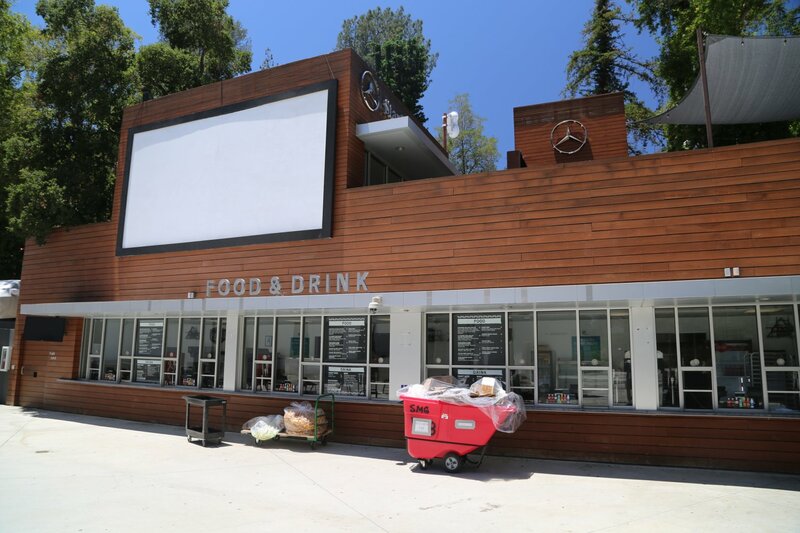 Parking can be challenging – the high priced parking is available in the several lots that surround the bowl. 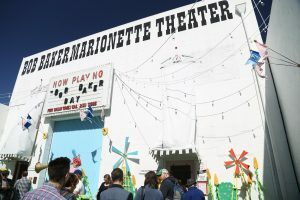 Some performances have 1 or 2 opening bands. 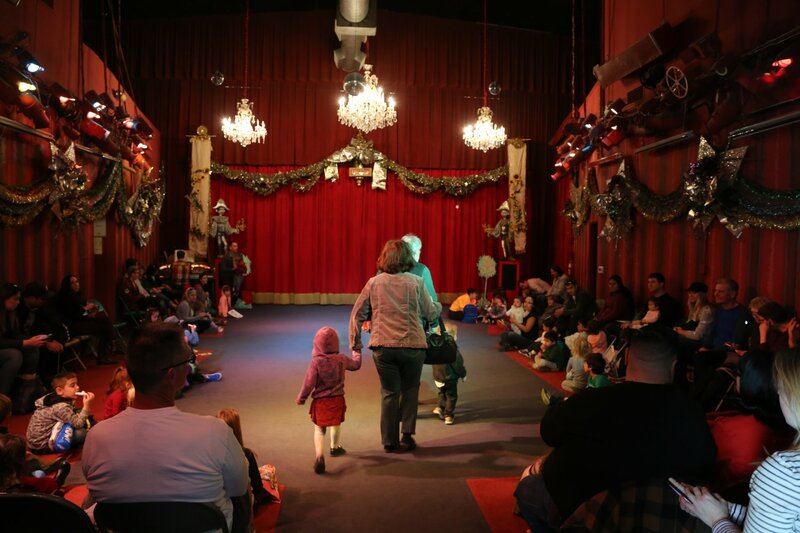 Often the majority of the crowd will come closer to when the lead band performs. 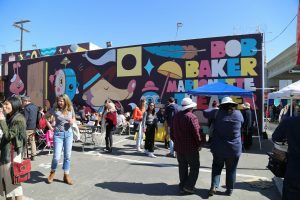 As a result, if a show is sold out and you wait until the last minute to park, some of the main parking lots that surround the bowl may be full. Note that all parking in these lots is stacked, so you cannot leave before the end of the show should you want to make an early escape from the exiting crowds. All nearby streets are also blocked by security to keep visitors from parking. 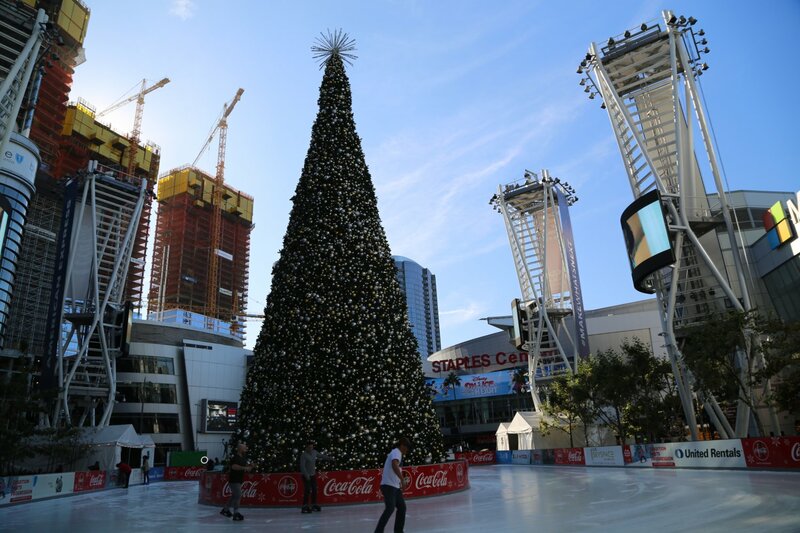 The best bet is to use one of the bowl’s nearby park and ride shuttles. We’ve used the Hollywood and Highland shuttle – this is a nice spot because of the large parking garage found here, and it is also within walking distance of the bowl, should you want to leave early (almost all downhill on the way back!). The shuttle is free the day of the concert if you show the driver your Metro ticket. Its mostly a downhill walk from the bowl to the parking lot. 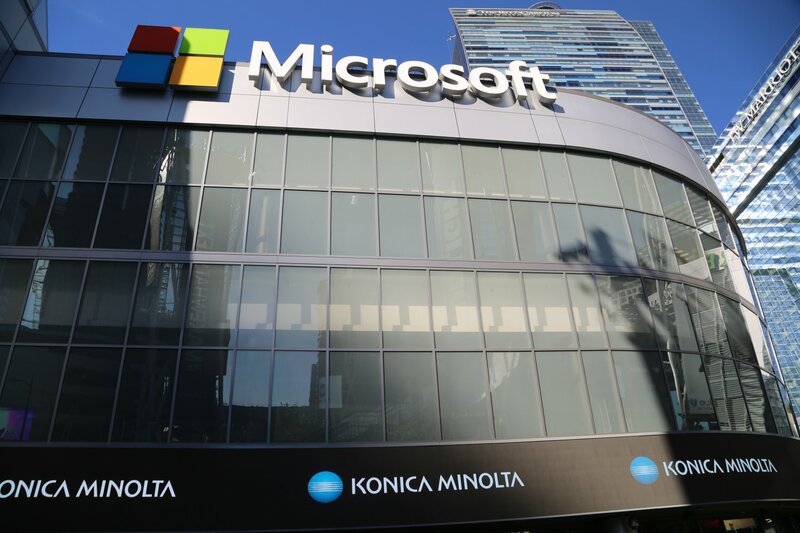 Microsoft Theatre (formerly the Nokia Center) is part of the huge LA Live mega entertainment center and is located near downtown Los Angeles next to the Convention Center and the Staples Center. This is one of LA’s hottest new theatres and already has hosted a number of well-known performers, celebrities and comedians. 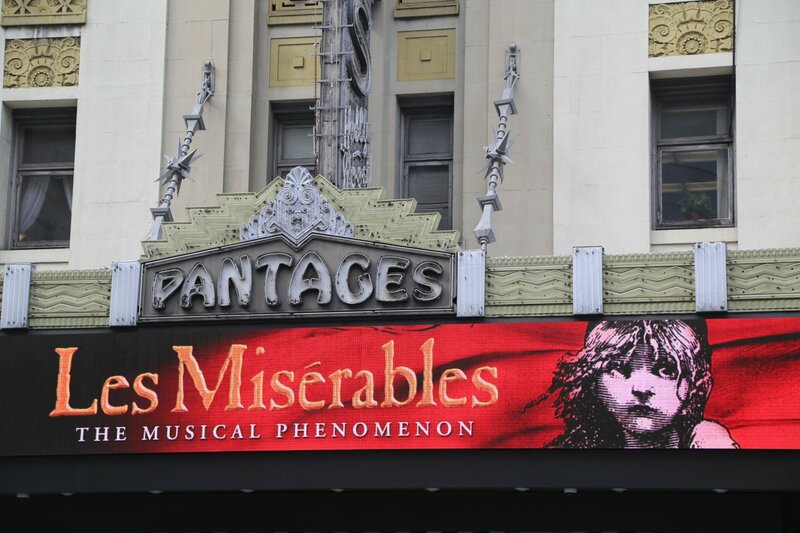 Pantages Theatre was built in 1929 and was home to the Oscar awards for 10 years. It is located at 6223 Hollywood Blvd directly across the street from the Hollywood & Vine Metro stop. 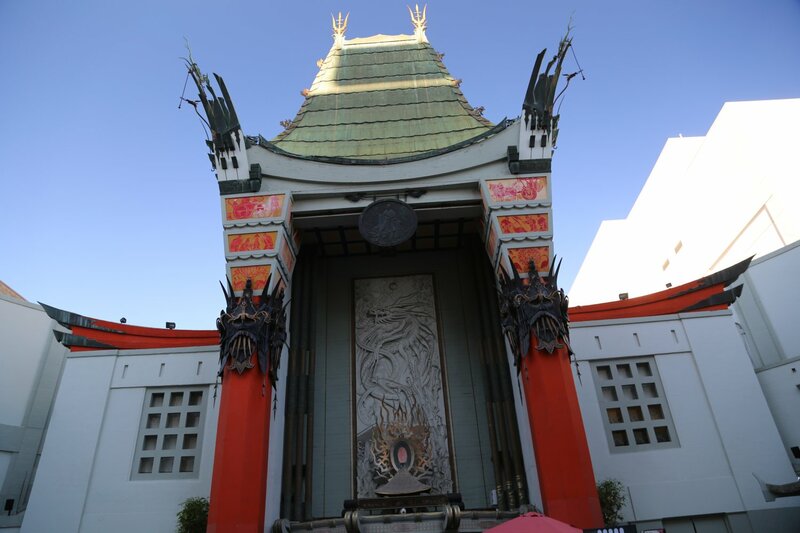 TCL Chinese Theatre is in the center of “tourist” Hollywood & the fairly new, already very famous, Kodak Theatre. 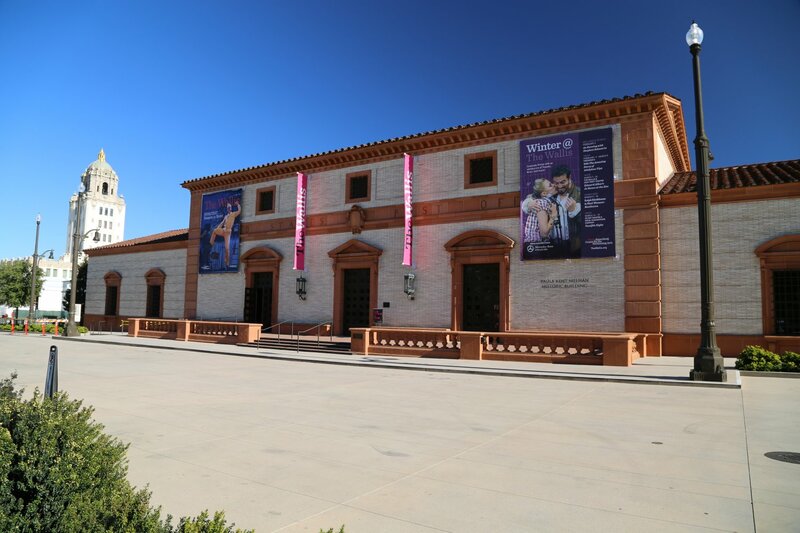 You can start your walking tours here – parking is available in a garage almost directly behind this theatre. 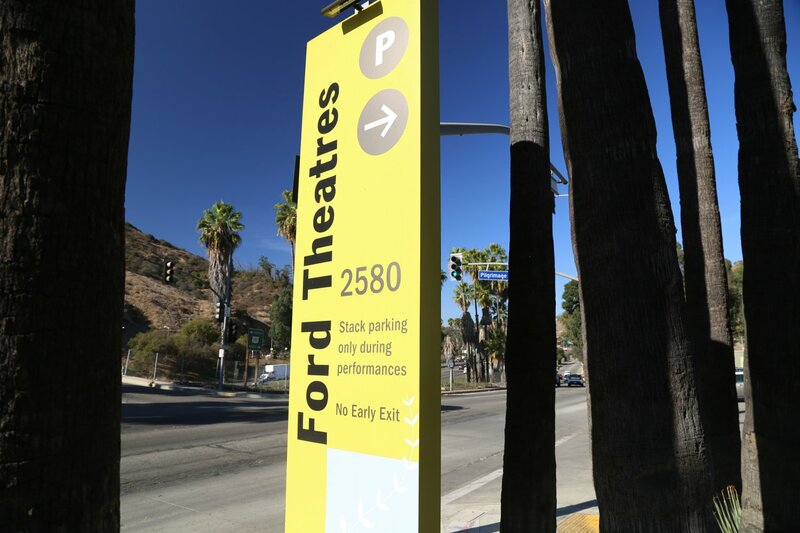 Be sure to purchase something as when you show your receipt to the parking attendant you will receive discounted fare. 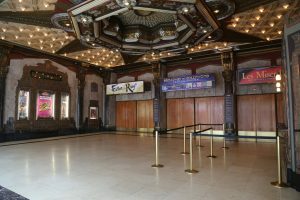 Tours of theatres may not count towards discounted fares. 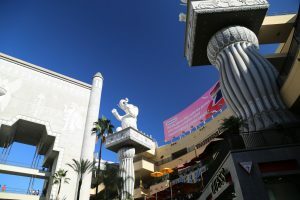 Since you are in the heart of the film industry, to cover your parking cost, consider buying a cheap movie at the Virgin Megastore located next door to Graumann’s Theatre in the Hollywood & Highland shopping complex. The front of TCL Chinese Theatre contains embedded hand prints and words from the most famous of actors and actresses over the years. 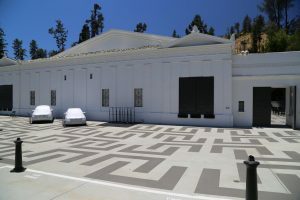 Squares of concrete are reserved for individual actors. 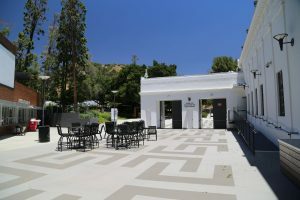 Current actors and actresses continue to press their hand prints and write small notes into the concrete squares here. Its always a big hoopla and red carpet event when an actor/actress puts their hand print in the concrete here. 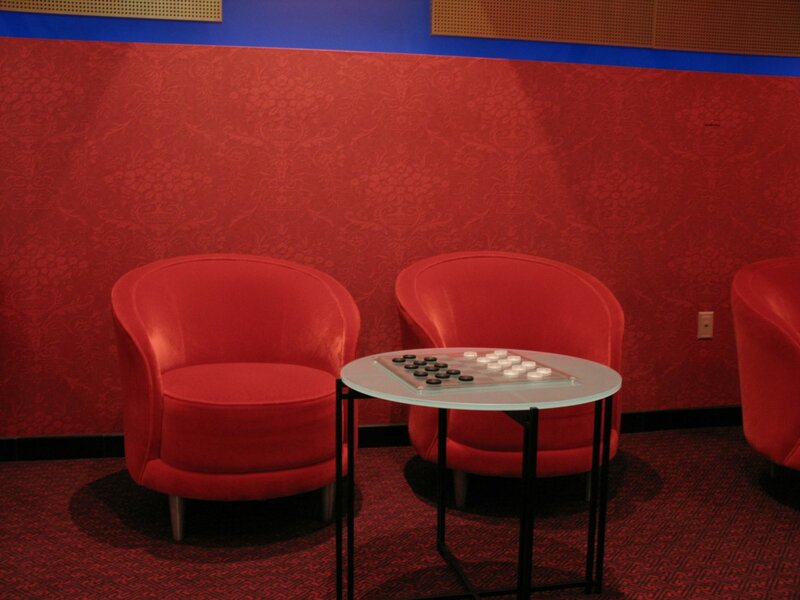 You can return a few years between visits and you will see new hand prints. 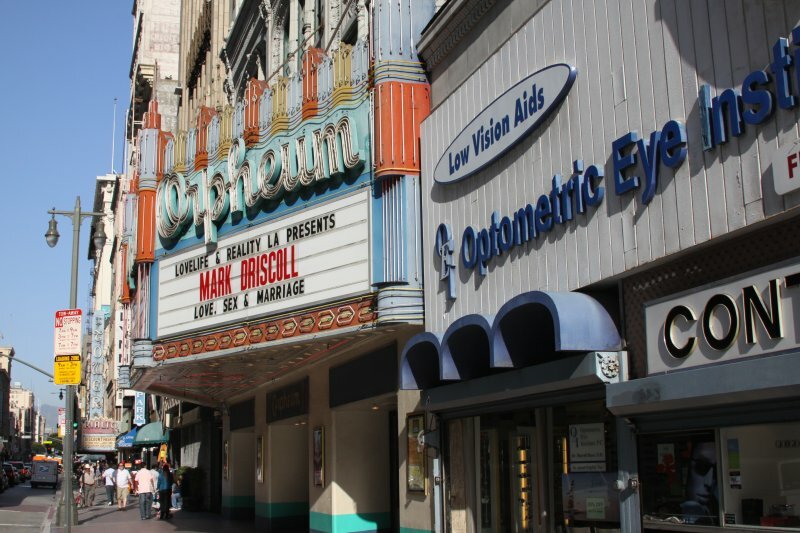 In addition some movies use this venue for their worldwide premier and if its an A list movie you will probably see a plethora of Limos parked on Hollywood Blvd and you most likely be in worse traffic than normal as one lane of Hollywood Blvd will probably be closed to traffic. 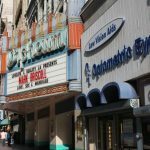 The front of this theatre is an excellent place to take photos and is always highly crowded, especially in the summer months. 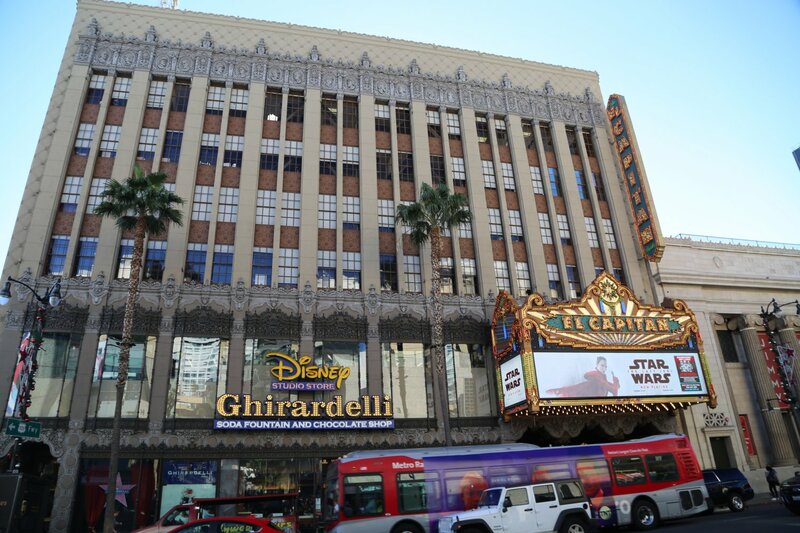 This theatre is probably the most popular movie theatre for new movie premiers and is highly sought after by studios. There are several “movie characters” hanging around, who are in costume here – be careful for the one that looks like Freddy Kruger leaning against the wall without arms showing and no eyes. He looks like a sculpture. However when you walk in front of him he will jump out and wave his plastic knife excitedly – most tourists are completely shocked when this “statue” comes to life in front of them! Highly recommend putting yourself in viewing distance of this character and watch the tourists reactions. 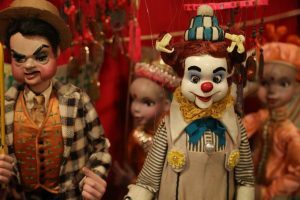 These characters will ask for tips if you take a photo with them. $1 per photo is probably fine. They do real well I imagine based upon all the tourists who take their photos with them. Chewebacca is another popular costumed character here. Wallis Annenberg Center for the Performing Arts is located off of Santa Monica Blvd almost directly across from the famous Beverly Hills sign. 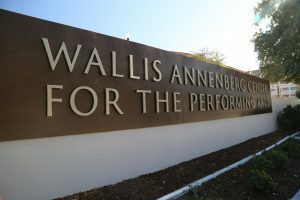 Named after philanthropist and heiress Wallis Annenberg (huge patron of the arts, locally see the Annenberg Space for Photography, USC Annenberg School for Communication and Journalism and the Annenberg Community Beach House in Santa Monica). This center features 70,000 square feet centered around the original built in 1933 Beverly Hills Post Office which is now the theatre’s lobby. 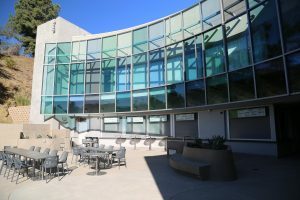 The building contains two theatres; the 150-seat Lovelace Studio Theaters and the 500-seat Bram Goldsmith Theater. 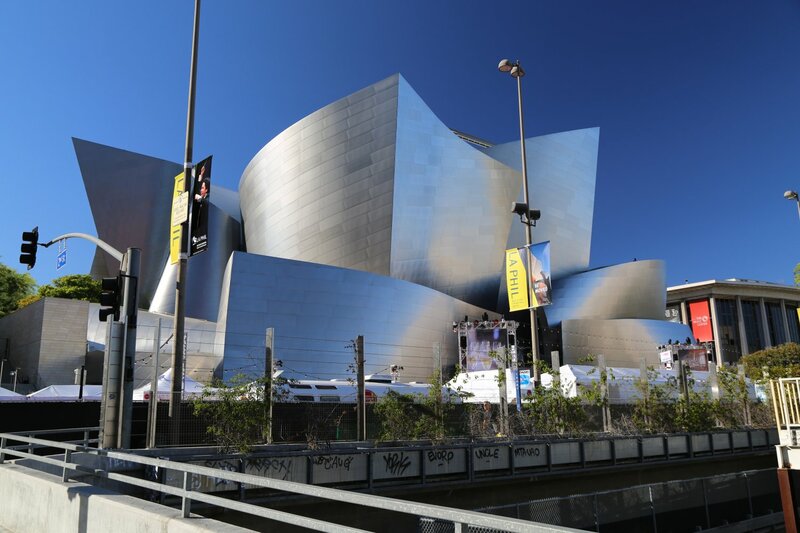 Walt Disney Concert Hall is located at 111 South Grand Ave in downtown Los Angeles (between 1st and 2nd Streets). 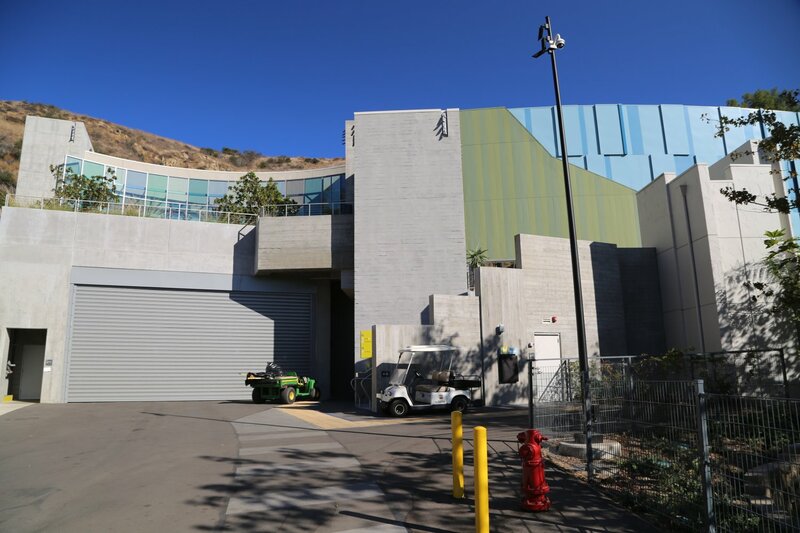 Exit Grand Ave as you drive north bound on the 101 (just before the 110 interchange) This major state of the art high end acoustical rich building opened in late 2003. 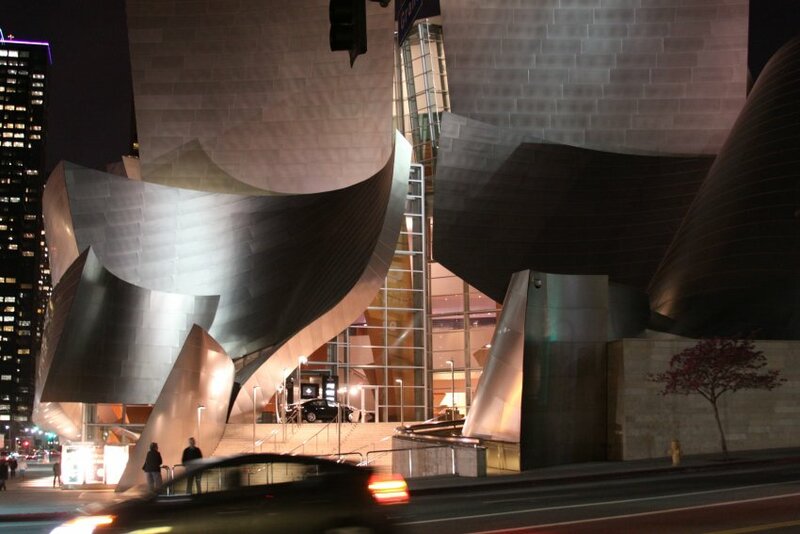 This building was designed by the famous architect Frank Gehry (See Bilbao Museum in Spain). Besides serving as a host to a wide variety of music, the Walt Disney Concert Hall is also the winter home to the LA Philharmonic. 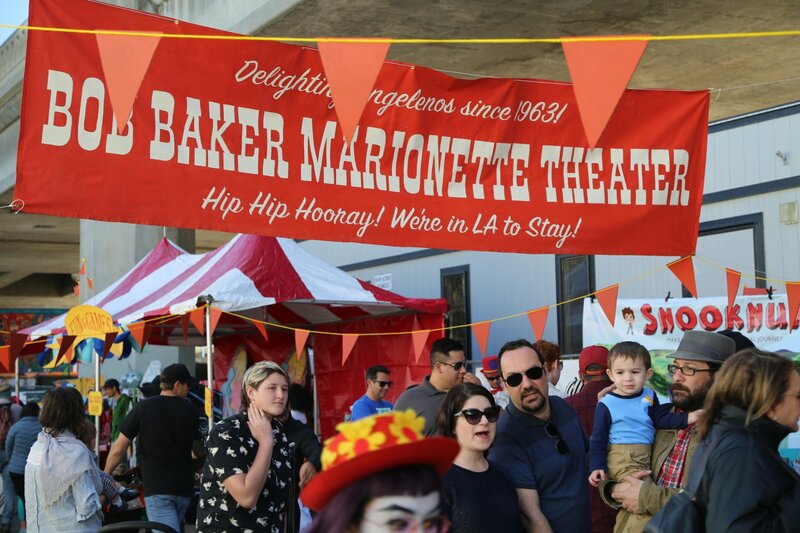 For ticket sales phone: (323) 850-2000 or purchase online. 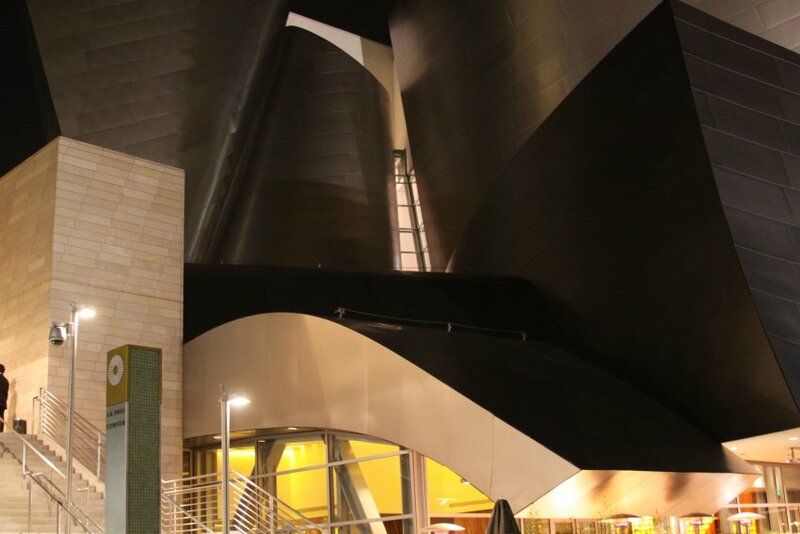 The outside of this prominent building is covered with brushed stainless steel plates. 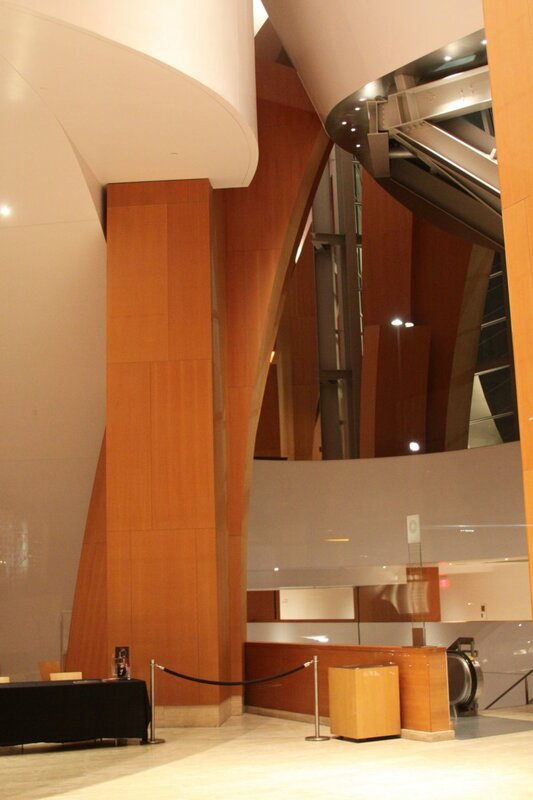 Along with other Gehry designed projects this building is full of curves. 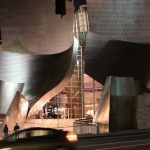 We’ve been to a number of classical performances at top West Coast venues and we have to say the acoustics inside the Disney Concert Hall are among the best. 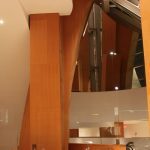 Wood paneling dominates inside the hall and is designed for superior acoustics. While seating over 2000 people, the actual hall does not feel huge or overwhelming. 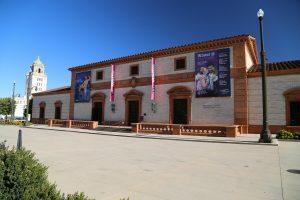 The cheapest seats in the house are usually found right behind the actual stage so if you are watching a classical performance you see the conductors face as well as the back of a number of the musicians depending on exactly where you are seated. 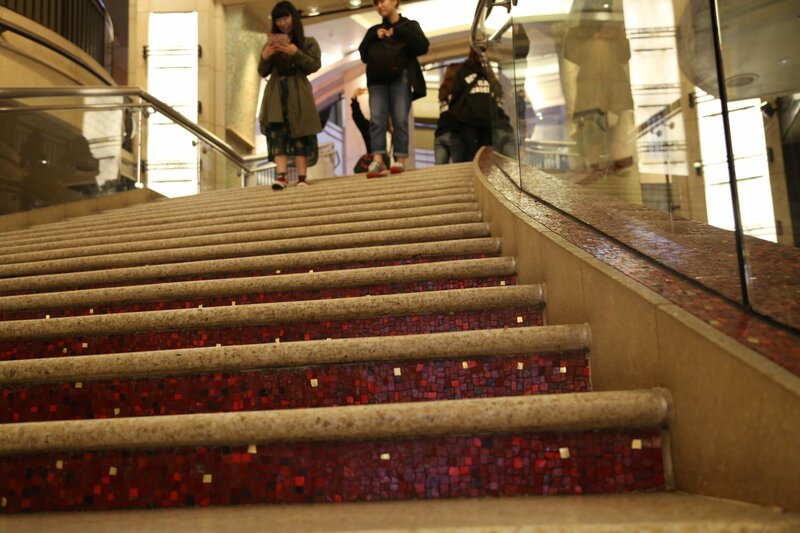 Before performances you may be able to walk out on the balcony which is located on the highest level of the concert hall. These doors are usually locked but ushers stand beside them and when you need to be let back in, simply knock on the door. The views of downtown from here are very good and you can see the upper most parts of this building very well. 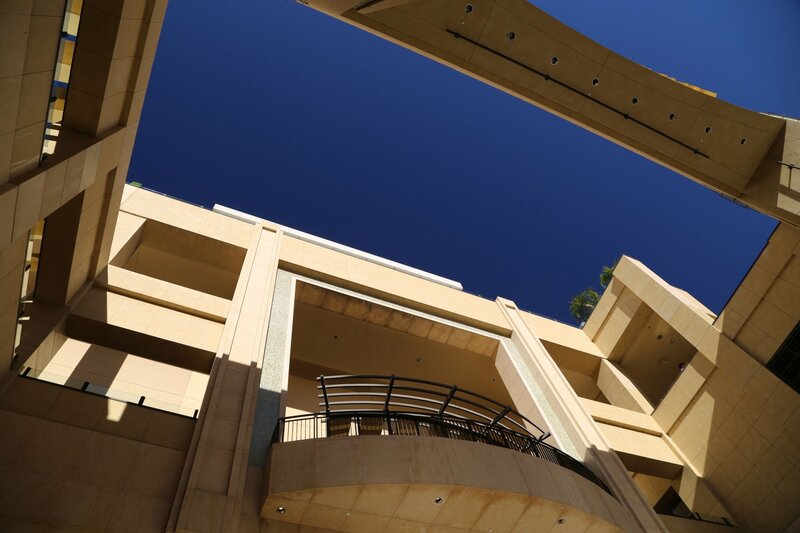 There is a parking lot directly below the center which is the most popular garage for events. As a result after a concert there is a mad dash down to this garage and you may have a wait as you exit. 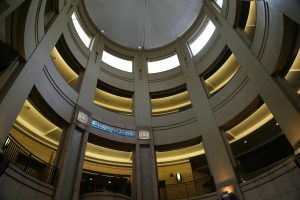 A much better solution is to park a block and a half away in the Grand Street underground garage. 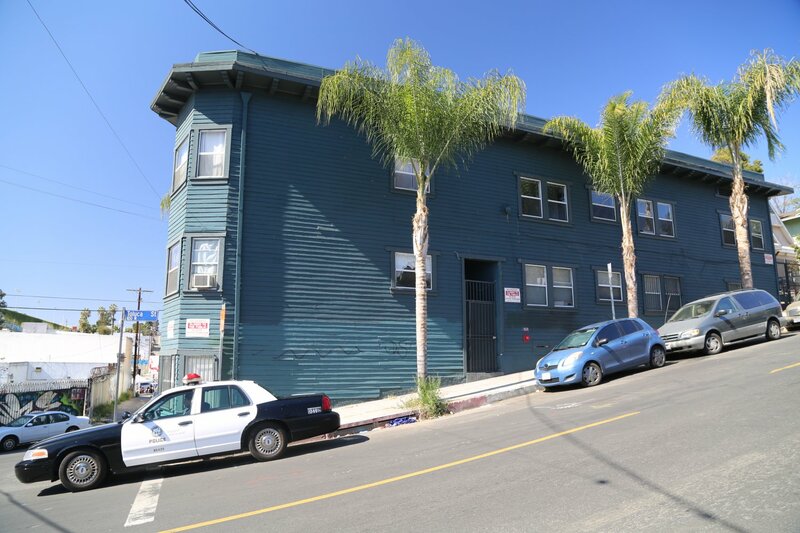 You pop up on Grand and you are within easy walking distance of the main entrance.